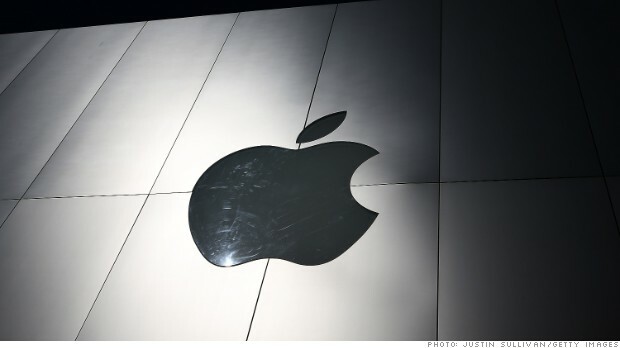 Apple sold $17 billion worth of bonds late Tuesday in the largest sale of corporate bonds ever. The company offered both fixed and floating rate bonds, with maturities of of 3, 7, 10 and 30 years. At $17 billion, the offering trumps Roche Holdings' $16.5 billion bond sale in 2009, according to data from Dealogic. Apple saw strong demand for its bonds, which were rated Aa1 by Moody's and AA+ by Standard & Poor's. "Whenever a company that's so highly rated comes to market, it's a big deal," said Jody Lurie, a fixed-income analyst at Janney Montgomery Scott. Apple (AAPL) did not immediately respond to a request for comment. The deal's underwriters, Goldman Sachs (GS) and Deutsche Bank (DB), declined to comment. Standard & Poor's and Moody's have already given Apple high credit scores, though Fitch has said the company's business model is not consistent with a AAA rating. Related: Which is worth more, coffee w/Tim Cook or a Lamborghini? There are only a handful of companies that have AAA ratings, so Apple's AA rating will make it popular with insurance companies and other institutions that need to hold high-quality assets, said Lurie. "Everyone wants a bite of the Apple," she said, adding that the order book for Apple's offering is rumored to have already reached $40 billion. Apple said earlier this month that it would tap the bond market as part of a plan to increase its share buyback program to $60 billion and boost its third-quarter dividend. The move is unusual for Apple, which has not sold debt to the public since 1996. Apple has amassed a cash hoard worth $144 billion as of the first quarter. However, much of that cash is stashed in overseas accounts, which means Apple would face a hefty tax bill if it were to bring the money home. Apple joins a growing number of major technology companies that are taking advantage of record low interest rates. Microsoft (MSFT), for example, sold $2 billion worth of bonds last week.